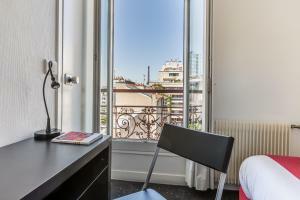 Hotel The Originals Paris Tour Eiffel Lecourbe is a 2-minute walk from the Sevres-Lecourbe Metro station, just a 10-minute bus ride from the Eiffel Tower. It offers spacious guest rooms equipped with a radio, a flat-screen TV and en suite facilities. Breakfast is served daily and guests of the Hotel The Originals Paris Tour Eiffel Lecourbe can enjoy regional and traditional cuisine at the hotel’s restaurant. Hotel The Originals Paris Tour Eiffel Lecourbe provides a 24 hour reception and there is also a flowered patio. Duroc Metro station is 600 metres from Hotel The Originals Paris Tour Eiffel Lecourbe and provides direct access to the Latin Quarter or the Champs-Elysees. Each room includes a flat-screen TV and a private bathroom with a bath or shower. Rate: € 53.20 ... € 228.33; select dates below to get current rates.